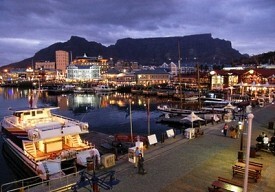 Cruises that visit or depart from Cape Town sail to other destinations in Africa. The "Mother City of South Africa" is celebrated for its beautiful beaches and award-winning vineyards. For a spectacular view of the cape, take a cable car to the top of the city’s landmark, flat-topped Table Mountain. Visit the wine country on a half-day excursion and take in the crisp vintages and the distinct Cape Dutch architecture, or tour the city and see St. George's Cathedral, the Castle of Good Hope, Signal Hill and the Victoria and Alfred Waterfront. Driving directions to E-Berth Passenger Terminal - Port of Cape Town from Cape Town International Airport: Travel on the N2 towards Cape Town, please keep in the right hand lanes as far as possible. From Nelson Mandela Boulevard(N2) take the second exit into the city to the first Robot. Turn right at the robot into Christian Barnard Street. Keep left until the last robot. Drive straight until you get to the security booms. Turn left at the stop street into Duncan Road and drive along for +/- 500m until you get to a three way stop (Duncan and Old Duncan Road). Turn right into Old Duncan Road. And immediately left into the entrance gate at E-Berth Passenger Terminal.